No matter the season, Alexandrians know how to celebrate. On February 17-26, 2017, 60 Alexandria restaurants will feature a $35 three-course dinner for one OR a $35 dinner for two during Alexandria Winter Restaurant Week. Be sure to check it out! Throughout the rest of the year, a host of events take place in the city, celebrating holidays, historical figures and the artistic scene Alexandria is renowned for. Be sure to see all of our Christmas and New Years events taking place this year. From annual festivals and parades, to art shows, live music, theater, history reenactments and holiday celebrations, Alexandria&apos;s award-winning culture never stops buzzing. 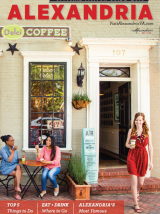 Sign up now for our Enewsletter to stay in the know about upcoming events, special offers on shopping and dining and other insider ways to access Alexandria. Stay in touch via Facebook and Twitter for up-to-the-minute updates on the world class events Alexandria has to offer.